One new inert pistol cartridge comprising brass case, fired primer and nickel plated truncated cone head. The calibre is the 10mm auto, 10mm automatic or 10mmx25. The cartridge was first developed in 1983 to provide a flatter trajectory with greater stopping power than the 9mm Parabellum. The result was a powerful round with the high energy of a magnum revolver cartridge that could be used in a semi-automatic pistol. Problems encountered during its intial trial with the FBI were higher recoil and the requirement of a larger pistol frame that was too large for some small-handed individuals. The FBI eventually settled on the shorter 40 S&W cartridge which is less powerful and has less expansion room in the cartridge case. Popular modern 10mm pistols include the Glock 20. The Glock 20 is used by the government of Denmark as a defence against polar bears to the Slaedepatruljen Sirius in Northeast Greenland. Other users of the 10mm cartridge include the FBI SWAT and Hostage Rescue teams. Price is for ONE round only. 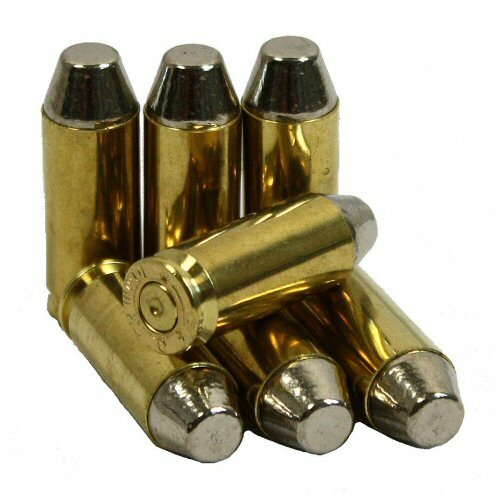 Due to inert ammunition being indistinguishable from live ammunition on an x-ray scan, these can only be shipped outside the UK using UPS courier.